Election fog is not cleared yet, but the emerging deal between Netanyahu, facing corruption indictments, and messianic right-wing Jews, bolstered by Trump, is "Annexation for Immunity". The specter of Rabbi Abraham Isaac Kook (1865 1935) and his teaching is haunting the State of Israel. A mystical messianic message, which over the past half century has evolved into the religious permit for the settlements in Palestine and murderous zealotry. Tel-Aviv, April 09, the outcome of today's general election remains unclear tonight. Both major parties have declared victory" [i] The outcome may take another 24-48 hours to be ascertained, since about 6-7% of the votes (soldiers, etc) , who vote out of precinct, take longer to verity and count. 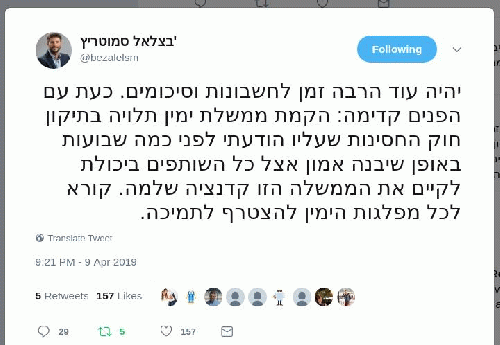 April 09, 2019, election day, 9:21 PM, Twitter message by MK Smotrich, stating, "...looking forward: Establishing a right wing government depends on amending the immunity act, which I have announced a few weeks ago..."
Media refer to the deal as "Annexation for Immunity". [iv] It includes an explicit quid pro quo - exerting Israeli sovereignty over the Palestinian territories in the West Bank - the wish of extreme right-wing Jewish settlers - in exchange for immunity for Netanyahu in his multiple corruption cases. In 2005, Smotrich himself was detained for a few weeks in relationship to actions against Israeli withdrawal from Gaza (Smotrich also today advocates re-conquering Gaza). No indictment was filed. Later, in 2015 and 2019 senior Shin-Bet officers claimed that in 2005 Smotrich had been detained while in possession of 700 liters of gasoline, apparently with the intention of perpetrating a major terror act. Smotrich denied such claims. The election was advanced and timed to undermine the scheduled filing of the indictments against Netanyahu. The cooperative Attorney General, Avichai Mandelblit (former Netanyahu Cabinet Secretary), went along and postponed the criminal process in order "not to interfere" with the political process of general election.